I absolutely LOVE this application because everything in this game is perfect. I can't ask more now since 2xl has added 2 more tracks for FREE. i was very surprised at how they want to keep the soul purpose of giving entertainment to the customers. Now lets move on to the game itself: Intro vid- There is a video in the beginning that really pumps you up in the adrenaline of this sport Graphics- The graphics are very fluid and feels like im playing a psp game caliber. You can't see pixels even when you stare point blank into the screen XD. Tracks- Now coming from a proffesional rider, he has put alot of time into creating tracks that are both unique and responsive. Feels like the real tracks in Seattle,Indianapolis, Dallas, Anaheim, etc. 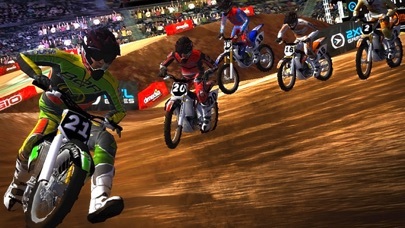 Tricks- This being a racing game, 2xl has done a great job of putting just the right amount of tricks. 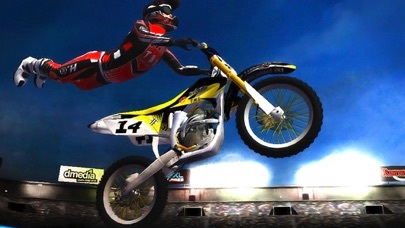 Backflips and whips are the 2 that takes time to master yet very fun to pull off when you are in 1st place. Riders- over 3,000,000 combinations. That's right. 10!= 3,628,800. Well worth the money if you love bmx. Thanks for the cool game and new cources.As the real needs and want the race configurations. Starting from the final semi-final if he wins, or loses last chance to go. I think many people would be more interesting GP.And,I want the crossing courses. Best game in app store!! This was the first paid app I down loaded when I got my iPhone. It's the only game I have not deleted off my phone. I thought $7.99 was a little steep at first? But do not regret purchasing it at all. Developers put a lot of skill and thought into this app. Graphics are the best of all games I have seen. Sounds are realistic and on the money. A thumper (4 stroke) sounds just like the real thing. Even the 2 strokes both 125 and 250 sound real. I'm a x motocrosser myself and this really brings back the memorys. Only thing different? I can sit in my recliner and not have to worry about wiping out. Look ma! No more broken bones!! She would be so proud of me. From x state champion to arm chair racer!! Would like to be able to add more laps and a few more courses. Maybe even more riders to compete against. 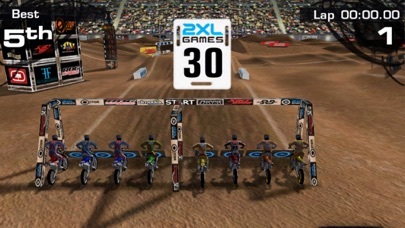 Would like 20 -30 riders all trying for the hole shot at the same time. Would make it even more realistic. But I'm sure that's coming. 2 thumbs up to developers!! This is the best all around game since the app store opened, from graphics to control this game raises bar for all future apps period. Console&PSP gamers that are still disbelivers I have two simple words for you, SHUT UP. These devs have officially put igames in the main stream. It's one thing not to even be a fan of the dirtbike genre and be impressed, but to be blown the freak away by what 2XL has done as far as graphx and control is another. These devs mean business and make no bones about it. And I hope they make tons, and tons, of dinero, being the first team to truly do what console,handheld,and PC gamers and critics said couldn't be done on the iPhone, which is compete. Currently playing: Galaxy on Fire, idracula, 3Dspinball, Elemental Monster, Puzzle Prism,pirate wings, space trader 3D, geo defense,and Fastlane. Waiting for: 7 Days Apocalypse, AIwars, CS one, LiveFire, Star Defense, or any of chillingo's coming titles. Disapointments: MGST. idream game: Lumenis. This is a great game, but it could be better. Its got very good graphics and audio, with beautiful details like dirt flying behind riders and the engine sounds moving to different headphones based on your steering. Once you get the hang of the controls and learn not to oversteer, it is very addicting. I noticed a big improvement in my play after changing the view, so make sure to try that by tapping in the upper right corner. Also, if you intend to use this game outside or in a well lit area, be aware that the tilt-control steering makes it very difficult to see because of glare. I have a few suggestions for the next version, however. The gameplay is phenomenal, but the game itself is very simple and straightforward. A story mode or power ups would be nice, as well as being able to easily do tricks. It seems like you guys are working on that and that sounds like fun. Also, after updating to 3.1 I have noticed minor slowdowns occasionally. I will not have to buy another game ever! I've found the best. 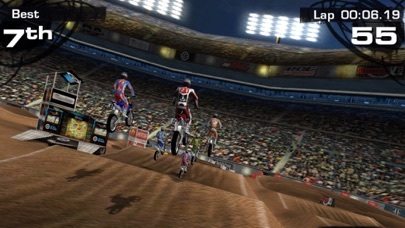 I love motocross and my iPhone, this is perfect. The graphics are great, the gameplay is great, and the sound is great. Takes a little getting use to the controls (I use the analog stick, not the stupid tilt controls) Please 2XL, do NOT add other vehicles. KEEP IT MOTOCROSS BIKES! I hope 2XL will have in-game new track purchases with Firmware 3.0. That would be awesome. I was initially put off by the price tag on this one, but it is worth every penny and then some. There is NOTHING in the App store right now that can even approach this. 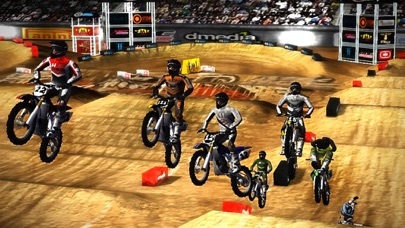 When I first got my iPhone I really wanted a Moto race game, so I got Moto Chaser and was horribly disappointed. I've found a couple of the car racers (Fastlane and Ferrari) to be good, but not great. This truly sets a new standard. The graphics are amazing, the gameplay and flexibility are there... But what really sets this apart are the CONTROLs!!! How many times have you downloaded a beautiful game, only to be frustrated by bad steering and poorly done controls? Not this time! Absolutely, positively the BEST feeling racer out there!!! Thanks- and fantastic job!!!!!! I think this is the only game I've paid good money for that the developer actually added content to the game with an update. I'm buying their ATV game now simply bc I love the way they treat their customers. I've spent hundreds in the app store and this has got to be my most used gaming app. While many ppl can enjoy this app, those who race bikes or just understand the sport are the ones who'll get the most for their money. I don't write many reviews but this one is a pleasure. I picked this game up back in the Lite version and found myself playing it over and over. It didn't take much to pull the trigger and get the full version. When we buy apps like this we want replayablity. Well, this app produces. You will never race the same race even if it is on the same track. Graphics are steller for a iPhone as well. I have bought many apps along with the free ones. I can honestly say that I find myself playing this far more than the rest. You in fact DON'T race around in a circle and you CAN do tricks....tabletops as well as backflips...single and double! This isn't a 'trick' type of game but there is that ability. Anyway, I love it and it kills time like a charm. this is the only Iphone app I actually paid for. most are weak and novel at best but this game is like having a play station in my pocket for those times when your needing to kill a few minutes. the handling was a bit tricky at first and Once I started using the analog stick I really started to love this game. Once I got used to it I was able to fly around the tracks and have a lot of fun. overall the game was well worth the 5 bucks. Amazing game but needs update! !